This year we're jumping on the ban wagon and trying our hand at some straw bale gardening. After coming across so many inspiring photos of different straw bale gardens, it seemed like a quick, space saving solution, and what's a planting season without a little experimentation. 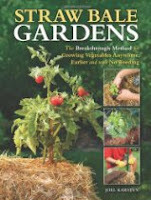 Straw bale gardening is exactly what is sounds like: growing your plants right in a bunch of straw bales. For those with limited space and time to lay out garden beds, this may be the perfect method (you can even grow a straw bale garden right on top of concrete!). It also would be a great garden for those who don't want to do a lot of weeding or who are unable to bend over. The way it works is that the straw begins to break down inside the bale and provides your plants with enough nourishment to grow. While you can use hay, the seeds in the hay bales will sprout into - well hay, and require a lot of weeding. Buy bales of straw at a gardening center or animal feed store. We decided to make a straw bale castle, complete with 2 (still to be completed) potato towers and an arch made from an old gazebo. You can place the bales of hay on their side or upright. Depending on how the bales are tied together, the string may disintegrate if it is against the ground, but some people argue that putting them string side down allows for better water retention. Next it is time to prep the bales. Start by completely soaking them. You can find many methods of fertilizing your straw bales (basically you need to add nitrate), but I opted for an organic approach and topped each bale with a mixture of aged cow manure, rabbit poo, and some bone meal. Soak the bales again and let the fertilizer soak in. Continue soaking the bales of hay for several weeks. During this time, the internal temperature of the bales should get quite warm. Once the temperature drops to below your own body temp, you can get ready to plant. If you choose to go the organic route, this may take a bit longer, but hey, we gardeners are used to taking it slow. Just like a raised bed, you can plant almost anything you like in your straw bale garden, although I've heard that some of the root vegetables don't do as well. We're planning to plant tomatoes, cucumbers, pumpkins, squash, and lettuce. When planting seeds, add a little seed starter or other soil to the top and sow your seeds. When planting transplants, make a small space in the straw bale and slide your plant inside. Now that it's planted, you can sit back and watch it grow, just don't forget to water! We're looking forward to sharing our results on our first straw bale garden (or straw bale castle) throughout the growing season. Would love to hear other experience and tips growing with straw bales. You may also link up interesting posts below as part of The Homesteading Resource Guide. If you have photos of your experience using different gardening methods, please share them to my flickr page (or email me at gstuppycarlson at gmail dot com) and I will share them within my posts (with due credit given of course). Need some more info to get started: check out this Straw Bale Gardens book. I'm so impressed! I'll be looking forward to progress reports! Any idea what you'll try planting/growing first? We're going to try tomatoes, squash, lettuce and cucumbers! I'm really excited - it looks a little silly now in our yard, but it should be a fun project. How cool! I've heard of straw bale gardening but wondered if it's something you need to build each year? Straw is pretty expensive here (about $15 a bale). I'm excited to see how your's turns out. I was thinking the same, they are about $12 here, but you could compost or use it as garden mulch! Apparently you can use good straw bales for 2 years (hay for one year). You also have a bit of compost at the end as well - but $12-$15 dollars a bale seems really steep! Around here it was $10 and even that was too much - we found some for $4-$5. We decided no new garden beds this year - we're already behind on the weeding as it is, so these were a nice alternative! I've been thinking about putting a straw bale garden in over my concrete driveway. I was thinking next year, but this seems so easy I might just do it now. Would love to hear how it goes on a driveway. What a novel idea, Gretchen. I just might give it a go. I'll be interested to see how this works out. I used straw as mulch one winter to cover a new flower bed. I had so many weeds from the straw that I had to crawl on my hands and knees to weed the garden. It took me weeks to get all of the weeds out.